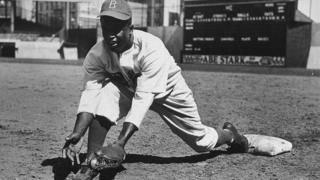 Monday marked the 72nd anniversary of Jackie Robinson being the first African-American player to take part in Major League Baseball (MLB), with his shirt number 42 circulating across American sporting social media in celebration. However, not all references to the day have been deemed appropriate. MLB posted many photos and tributes to Robinson, who paved the way for more black players to participate in the sport, across Twitter and Instagram. But when MLB added a Budweiser commercial saying "Rise up. #ThisBudsForJackie", it was soon criticised for being "tone deaf". The tweet has since been deleted. Baseball Prospectus writer Ginny Searle wondered who was responsible for approving the commercial, asking if it was MLB's or Budweiser's idea to have 'this bit of symbolism'. Sports writer Evan Drellich criticised the "thin line between honouring someone's memory and using someone's image and incredible strength to bolster your own corporate image decades after the fact". He added that someone at MLB must have felt the same, since the tweet had gone. One Twitter user pointed out that 70 years ago beer "would have been thrown" at Robinson, while another called it "one of the worst ads" they had ever seen and compared it to the use of Martin Luther King in a Super Bowl advert for Dodge Ram trucks. Danny Shapiro, web editor for Arizona Sports radio, called the tweet a "swing and a miss". The advert is not the only production around Jackie Robinson Day this year from Budweiser. The beer manufacturer is a sponsor of MLB and has made a large financial contribution towards the ongoing construction of the Jackie Robinson Museum. Robinson's daughter, Sharon, told Forbes magazine the company collaborated with film director Spike Lee, who produced a three-minute film advert, Impact, to mark the anniversary of Robinson's first game for the Brooklyn Dodgers in 1947. The film advert is narrated by Sharon, who was at Dodger Stadium in Los Angeles - where the team franchise is now based - along with her brother to celebrate the day. All MLB players wore the number 42 shirt - the only number to have been retired across all MLB teams - to mark the day, and many teams tweeted their appreciation for Robinson. The Dodgers praised his courage, saying "you changed everything" and posted photos of his relatives at the stadium. The Texas Rangers posted "This one's for you, #Jackie42", while the New York Yankees shared their thanks. MLB have been asked for a comment.